If you are one of those who loves to host get-togethers at home but don’t like to ruin your own or your pals’ diet plans then read on to know ways to balance the two aspects. The best bet in this scenario is to toss up salads which are healthy yet tasty, filling and also easy-to-prepare at home. Dieticians maintain that salads usually make the first step of a healthy diet plan. To some people, salad may sound un-appetising, but actually salads can be made interesting by experimenting with its ingredients with a varied choice of fresh vegetables, fruits and nuts. 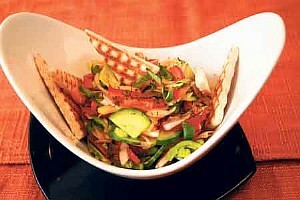 Besides being an effective tool for weight loss, salads have high content of fibre and nutrients. Salads are though usually served at the beginning of a meal, a salad with greens, vegetables, fruits and nuts can make a delicious low-calorie meal all by itself. You can add a small portion of fruits and vegetables to make salads rich with vital vitamins and anti-oxidants. In fact, by adding or subtracting any of the ingredients, one can end up preparing a new salad with a new taste, each time. Make it flavoursome by adding fruits, nuts, lean meats and salad dressing. Healthy salad recipes are getting a special place in the cookery books. Some of these salads include: Warm Mushroom Salad, Grapes and Apple Salad, Orange Blossom Salad, Oriental Chicken Salad with Nuts, Tomato Avocado Salad, Carrot Raisin Salad and Fruit and Greens Salad etc. Grapes and apples are both available at the stores even during the monsoon. So, take a pick of both. Take a pan and heat gelatin on low flame. Stir constantly, till it gets dissolved. Add apple juice to it. Let it cool, till the mixture thickens. Stir in fruit and celery. Cool it until the dish sets. You can avoid using gelatin by tossing all the fresh ingredients together in olive oil, add a dash of fresh ground pepper, pinch of rock salt and some apple juice or lime juice to add taste. Eat fresh.